Let’s talk about the cashew nut. It’s delicious, nutritious, and it’s helping many African communities to build sustainable economies. Now let’s talk about the cashew apple. If you aren’t familiar with this cashew product, you aren’t alone. The apple – which is actually the swollen stalk of the true fruit, the nut – is edible, with a juicy red or yellow pulp underneath its fleshy exterior and a strong, sweet taste. Despite its potential for food, this cashew product is traditionally discarded upon harvesting and is considered waste. 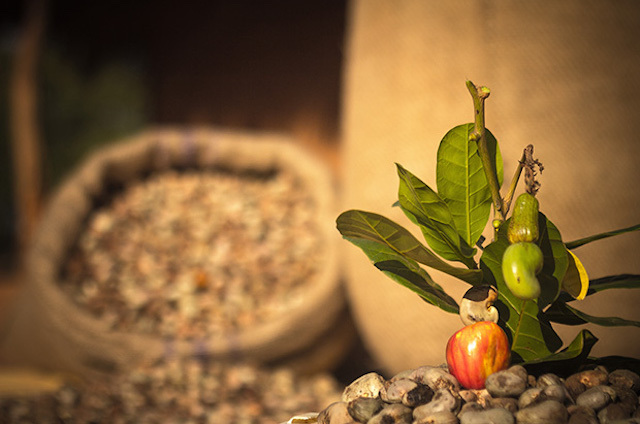 In fact, there is a great deal of unseen work and “waste” that goes into preparing a trade-ready cashew nut. The nut is first separated from the apple on the farm. Then the cashews must be dried, transported to a processing center, steamed, shelled, peeled, graded and packaged. Several TechnoServe projects are harnessing the untapped potential of these lesser-known activities to support an often underserved community in the cashew value chain: women. The Women Entrepreneurs in Cashew Apple Processing Project in Nigeria, an initiative funded by the Citi Foundation, seeks to increase and diversify women’s income through the use of the cashew apple. TechnoServe staff in Nigeria identified the interest of women and youth – who are largely excluded from participating in the traditional cashew harvest – in learning how to turn the cashew apple into products for local sale. Through training sessions and marketing support, TechnoServe helped 60 women from the Kwara and Kogi States to begin selling cashew plum (a dried fruit snack), cashew honey and cashew cake (locally known as kuli kuli). 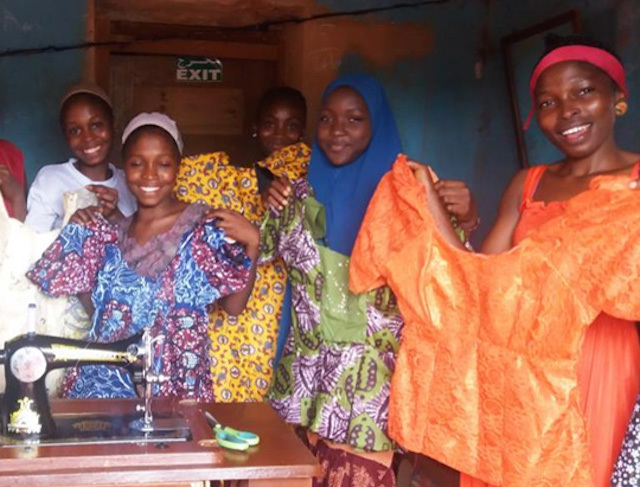 Jemila Musa (right) and her apprentices in Jemila’s tailoring workship. Jemila raised the capital to build her tailoring business by selling goods made from cashew byproducts. While one of the initiative’s key results is additional income for the participants, an important additional benefit has been the feeling of empowerment gained by women within their families and communities. The project works to sustain this impact by training women to reinvest their earnings from cashew products into off-season businesses. For instance, Jemila Musa used the capital from her cashew honey and snacks in 2015 to buy a sewing machine, and established the only tailoring business in town. Through the project, Jemila has become a leader in her community. “Producing the cashew honey and snacks makes people know me,” she says. Jemila also began perpetuating this cycle of respect and growth by including other women, teaching neighbors to process the cashew apple and training apprentices in her tailoring workshop. The first class of apprentices has already graduated, and she has now enrolled new ones. These women are training in her expanded shop, as Jemila was able to buy an additional sewing machine with the money from her 2016 cashew sales. In Benin, Béatrice Houndjè has also improved her role in her family and community through cashew processing. Unlike Jemila, however, Béatrice works with the cashew nut itself, peeling cashew kernels at Fludor Benin SA, a new state-of-the-art cashew processing facility. Béatrice Houndjè (left) greets Lucy Tamlyn, the U.S. Ambassador to Benin (right), at the Fludor satellite in Bohicon, Benin. Fludor opened in 2016 with the technical support of BeninCajù, a five-year project funded by the U.S. Department of Agriculture (USDA) and implemented by TechnoServe in partnership with Catholic Relief Services. The project aims to strengthen and expand the cashew sector into an inclusive economic growth engine for the people of Benin, increasing Benin’s domestic cashew production by 15 percent. Béatrice and Jemila demonstrate how the many diverse niches within the cashew value chain can open the door to many opportunities for women as they strengthen their family and community economies. Read more about how TechnoServe is working to make the cashew sector more competitive, sustainable and inclusive.